Israel Resilience and Yesh Atid agree on joint Knesset run. Former IDF Chief of Staff Gabi Ashkenazi joining as well. 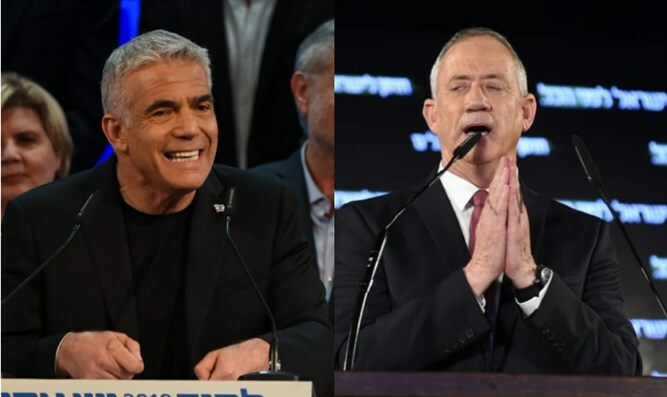 Israel Resilience chairman Benny Gantz and Yesh Atid chairman Yair Lapid announced on Thursday morning that they had reached an agreement on a joint Knesset run. Former IDF Chief of Staff Gabi Ashkenazi has also joined the united party. Gantz and Lapid agreed, among other things, on a rotation in the post of prime minister. Gantz will serve first in the post and Lapid will replace him after two and a half years. The rest of the list will be put together using the “zipper” method between the two parties – one spot for a candidate from Israel Resilience, followed by one spot for a candidate from Yesh Atid and so on. “Motivated by national responsibility, Benny Gantz, Yair Lapid, and Bogie Ya'alon have decided to establish a joint list that will constitute the new Israeli ruling party,” the parties said in a joint statement. “Recognizing this pivotal moment and the national task at hand LTG (res.) Gabi Ashkenazi has also decided to join the new party,” the statement said. Party leaders will make an official announcement later on Thursday. Earlier this week, as he officially introduced his list of candidates, Gantz made clear that the door to a joint run with Yesh Atid had not yet been closed. "Immediately after the event, I will call Lapid and propose that he meet again tonight," he said.